MUMBAI • A 117-year-old condemned building collapsed in the Indian financial hub of Mumbai after two days of torrential rain, killing at least 21 people, with some feared trapped. Thirteen people were rescued and were recovering in hospital, with six firemen also injured in the six-storey building yesterday, the chief fire official said. "There was a massive bang. We couldn't see anything due to the dust and smoke," said resident Amina Sheikh, who lives in the area. "Once the dust settled, we realised it was a building collapse." In Karachi, at least 13 people were killed after rain hit the Pakistani city overnight, officials said yesterday. 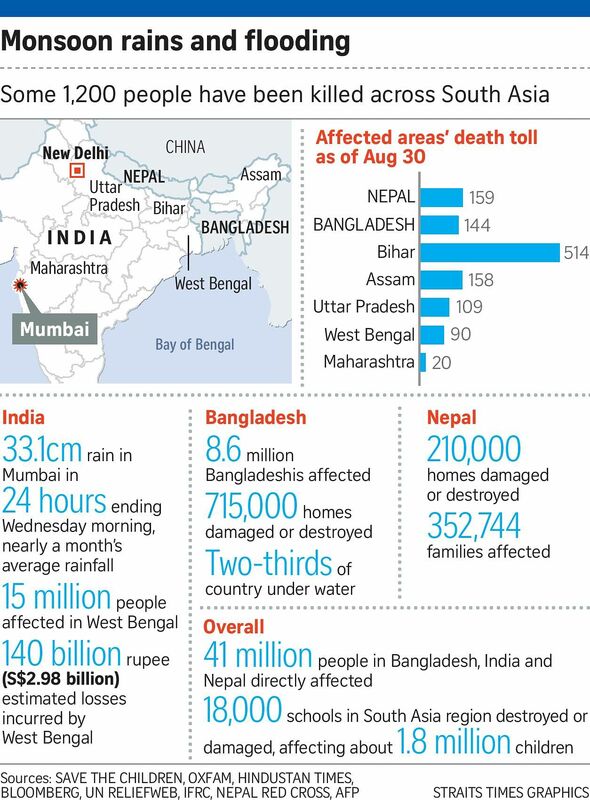 The collapse in Mumbai was the second in the city in just over a month. In late July, 17 people died when a four-storey building collapsed after suspected unauthorised renovations. The building that collapsed yesterday was in one of the city's most densely populated areas and housed a nursery school, despite being declared unsafe by the city's municipal housing authority in 2011. And families were still living there. Desperate relatives pleaded with rescuers to help locate their loved ones after getting phone calls from trapped survivors. About 200 police and fire personnel sorted through the debris. Police have yet to determine what caused the collapse near Crawford market, a landmark of south Mumbai's old city with narrow streets packed with stalls and shops. Rescuers said the area's narrow roads made it difficult to bring in excavators. The building also housed a sweet shop warehouse on the ground floor. The nursery school was on the first floor, but the collapse happened before the children arrived. Chief Minister Devendra Fadnavis of the state of Maharashtra said the government gave final notice for the building's demolition in May last year. The building was among 791 that the city's municipal corporation listed as dangerous. But residents frequently refuse to leave and, as a result, only a few of those buildings have been evacuated or demolished. An official of the Brihanmumbai Municipal Corp said more than 500 were still occupied. A housing trust looking to redevelop the area said the housing board had offered alternative accommodation to tenants, but only seven families had moved out by early 2014. Some residents of the area said people were not given details of what type of new housing they would get, making them reluctant to leave. Resident Ati Allah, 60, said: "We don't have any problem. But there is no clarity on how the government wants to do redevelopment."